My good friend Helen in Powell River always offers me tea and "nummies" when I come over for a visit. In case you aren't familiar, a nummy is something delicious, yummy. Helen's nummies range from macaroons dipped in chocolate to sweet muffins. Ed's sure a lucky husband. He get nummies all the time. At our cabin, I like to bake nummies of my own. Since our wood stove is going 24/7 during winter, I've created some unique ways to bake including a gutted toaster oven and a cast iron dutch oven. Here are a few of my nummy success stories. Follow the links for the recipes. 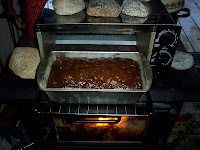 Toaster Oven Cabin Cake -- This cake doesn't have any eggs, perfect for minimal cabin ingredients. The toaster oven traps the radiant heat. 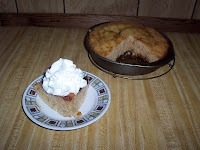 Cooking time is slow, but this moist cake still comes out great. 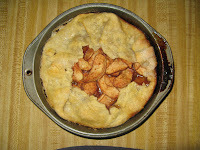 Dutch Oven Rustic Apple Pie -- I put a metal rack inside my cast iron dutch oven and bake cakes and pies using the trapped heat. I used my wood stove thermometer and it gets to about 300 degrees inside. Some heated rocks on top of the pot to provide extra heat. Here is another stovetop dutch oven favourite. The cake is really rich, but nummies are NOT meant to be diet fare. We've had a cold spell in Powell River for the last week, even a few snow showers. The other morning I went out early to my floating garden to check on my recently sprouted veggies. As I walked around, I stopped to admire my daffodils in full bloom. When one of them started to buss at me I did a double-take. Deep inside the centers of several flowers were bumblebees just waking from a cold night's sleep. As the sun crested over Goat Island, it's warming rays reached the bees inside their daffodil tents. They moved from inside the flowers to rest on the outer petals. I watched one bee as he stretched his legs one at a time as he woke to the day ahead. Last Saturday Wayne and I took our quads for a ride up the main to the head of Khartoum Lake. We've been to the lake several times, but this was the first time we went all the way to the head where the Lois River enters. If you want to see more about the trip, I've created a video about it for YouTube. Today was cool with showers so the guys decided to work on changing the engine in our Bayliner. After delivering lunch I decided to go shopping at a few of my favourite thrift and used book stores. My first stop was the Hospital Economy Shop off Alberni near Scotiabank. As usual, I bumped into my friend Carol while browsing the aisles. Next I headed down to Marine Avenue. I love shopping on Marine. It has lots of quaint shops, yummy restaurants and activity. It's an easy walk all the way from the ferry terminal on Wharf Street to the end of the shopping area at Alberni. 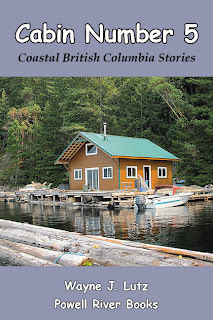 Along the way you will find the Hidden Treasures Bookstore on the west side of the street as you approach Alberni. It is open on Wednesdays, Fridays and Saturdays from 11:00 to 3:00. If you are nearby on one of those days be sure to stop in for a look. For a small shop it has a nice selection of books on lots of topics. The books are organized and attractively arranged in several rooms. I found another book for my Farley Mowat collection. If book browsing makes you hungry, try Rene's Pasta just down the block. I popped in for a blackberry gelato made with huge berries on top and mixed in. Yum!! 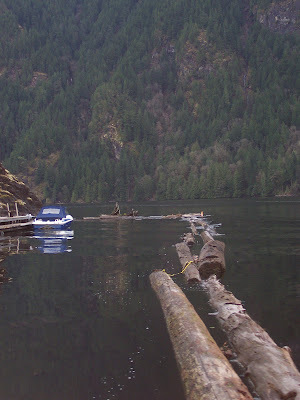 Logs are an important part of our lives on Powell Lake. First, they form booms that provide us with protection from storm waves and wakes from passing boats, and mark our leased water lot. Logs are the support structure for our floating cabin. Forty-foot cedar logs are lashed together for the foundation. 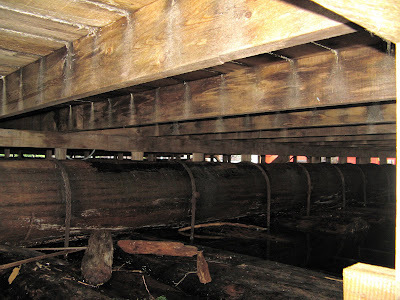 On top of the main float logs, which provide buoyancy and stability, vertical braces (pony logs) create a flat surface for the decking and cabin floor. In Pesky Bushy Tailed Woodrats I told you how we used a Havahart live trap to capture two woodrats who were eating my garden produce. Havahart has a wide variety of traps to humanely capture animals for later release. For our mouse needs, we chose the Two Door Mouse Trap at the Powell River Rainbow Valley Farm and Pet Supplies. Since we hate to kill animals, it was the right choice for us. With the onset of spring, the mouse population is increasing. My title is a little misleading. We haven't had any mice inside our float cabin, but we don't want to wait until it becomes a problem. Each night we set a trap on the deck, and in the morning have been "rewarded" with a little deer mouse ready for relocation. Hopefully it isn't the same mouse coming back for more peanut butter. What we can't figure out is how the mice survive on the float. There are no identifiable food sources. We wonder if maybe they live on the float and cross to shore at night to eat. But when we leave for extended periods, we pull in our gangplank. I guess there is only so much we can do to rid ourselves of mice without worrying too much about their wellbeing. 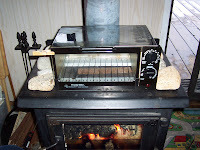 In my March 26 post, I shared a picture of an old wood stove that our friend John found in the forest at the head of Powell Lake. Here's the rest of the story. 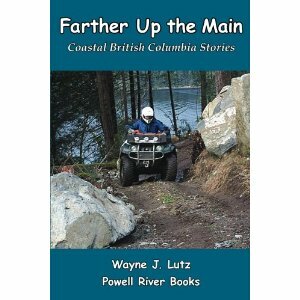 Since the turn of the century (20th that is), rugged individuals have worked in the forests surrounding Powell River, BC. First loggers came through to chop and saw down the trees for lumber and pulp to be used in the paper mill. You can still see huge stumps with springboard holes on the side. Loggers cut a notch in the trunk and then put a long narrow springboard into the notch to stand on. From this precarious perch they would chop or cut the tree at a height of about ten feet. Not a job for the feint of heart. Following behind the loggers were shake block cutters who took advantage of the cedar logs and stumps left behind. The cabin we happened upon belonged to shake blockers. The first hint that someone had lived in the area was a decrepit fence along the lakeshore. Behind the fence was a cabin site, but the four walls had already fallen and were rotting away to nothing. 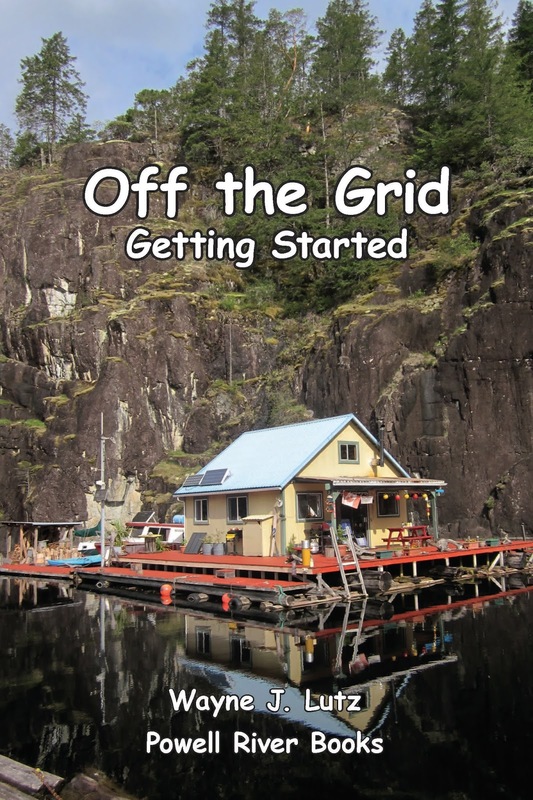 What did remain was a small stack of old shake blocks covered with moss, evidence of the road they built to get their shake blocks (used to create shingles) to the lake for transportation, the stove, a root cellar, an outhouse and a trash dump. Based on the items in the dump, John estimated the site was used in the 1950s. The outhouse was quite unique. The sides were six foot high slabs of cedar split lengthwise, apropos for shake blockers. John couldn't pass up a rear "window" for a photo op. "Here's Johnny!" The dump included lots of bottles and cans. They ate lots of canned corned beef and liked their Copenhagen chewing tobacco. 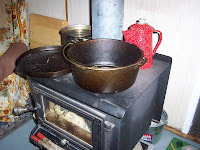 There was also a rusted pan that must have been used for baking bread in the wood stove. 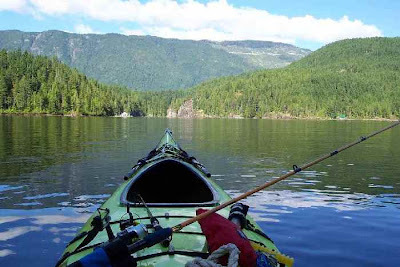 Coastal BC is a great place for kayaking. 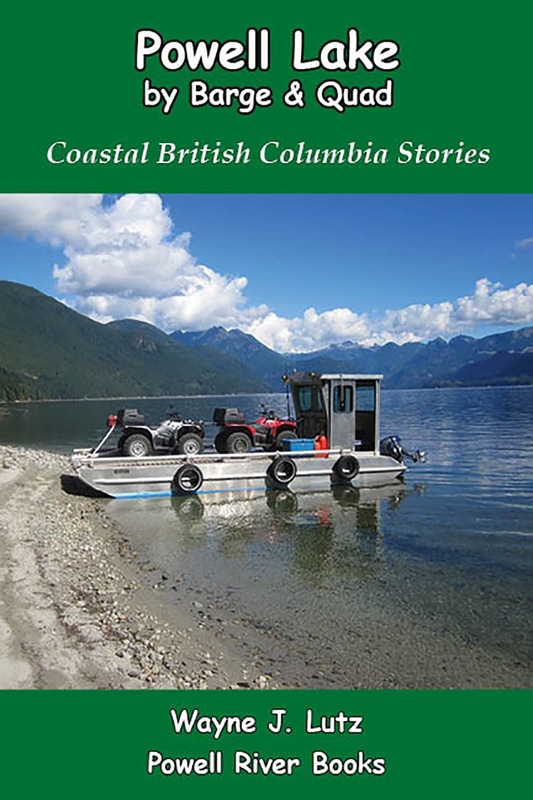 There are lots of protected inlets and bays to explore for the novice and expert alike. 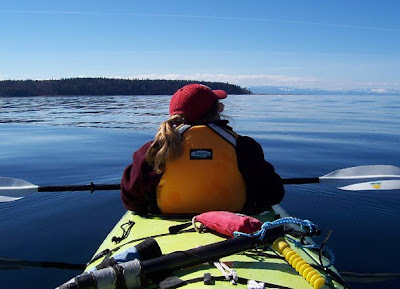 We started by renting kayaks at Powell River Sea Kayaks. They have excellent equipment and guides. When we were sure we liked the sport (and we did), we purchased one of their used models at a really good price. We call our kayak the big yellow banana for obvious reasons. 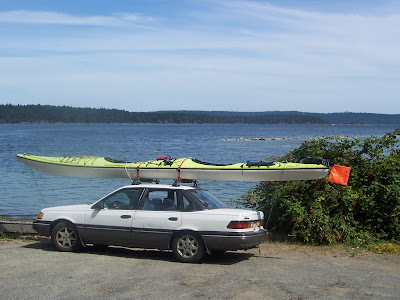 She turns lots of heads when we drive around town or onto the ferry with her on top of our little Ford Tempo. This is a back seat view from our Current Designs two-person Libra XT. 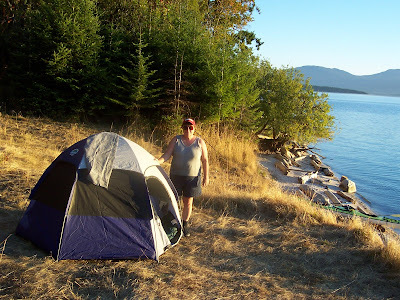 It is very stable even in rough water and has plenty of storage space for overnight camping. It is also great for fishing as you can see. We have lots of days when the weather is excellent for heading out over open water. In summer, our biggest fear is running into one of those huge pleasure yachts heading up to Desolation Sound. You know what they call kayaks don't you -- speed bumps! When we decided to start a garden up on our cliff we needed to develop a watering system. 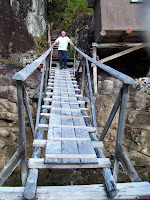 To get to the garden you have to cross the bridge to shore and then go up four sections of stairs. That's a long way with buckets of water. So, we went to our good friend John and he designed a custom system just for us. First he cleared some salal plants farther up the hill. A 55 gallon blue barrel was selected for water storage. He drilled a hole near the bottom and inserted a faucet. This attaches to a hose that runs downhill, providing the water pressure needed for the spray nozzle. To collect water he placed a large funnel in the one open hole in the top of the barrel. Water could be hauled up the hill and poured into the barrel through the funnel, but that's a lot of work. 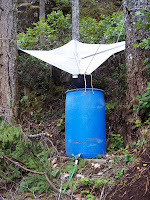 To make it easier, rainwater is collected by a large tarp suspended between the trees. One corner of the tarp is connected to the funnel and a long 2X4 keeps everything in place. We have some very strong wind storms at our cabin, but the tarp has remained in place for over two years.